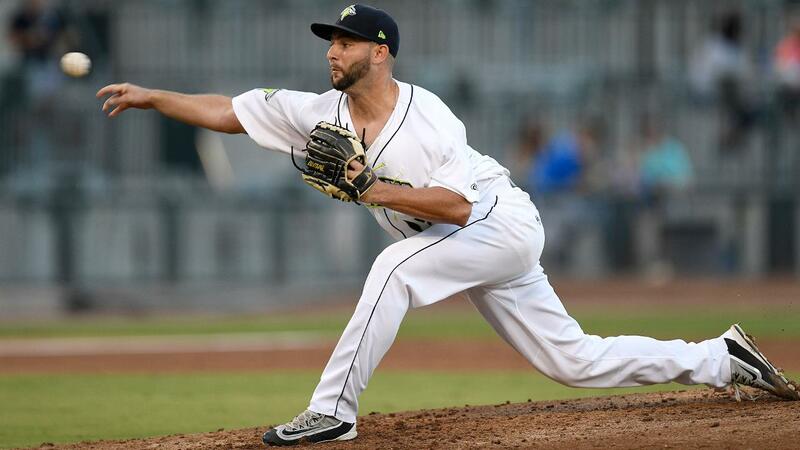 COLUMBIA, SC - Zac Grotz struck out eight and pitched into the seventh inning on Wednesday but the Fireflies fell to the RiverDogs, 6-1. Columbia must win the series finale on Thursday to split the four-game set. Grotz (L, 3-6) turned in his third straight quality start on Wednesday. He allowed just one earned run in 6.1 innings. This performance is on the heels of back-to-back wins against Asheville and West Virginia. Over his last three starts, Grotz has struck out 24 and has walked just two batters. Columbia (61-67) led 1-0 when Grotz stepped back on the mound in the top of the seventh. Three runs were charged to Grotz in that inning but only one was earned. After an error allowed a Charleston (61-70) runner to reach, Dermis Garcia dug into the right-hand batter's box. Garcia had struck out three prior times against Grotz, but this time, was facing reliever Darwin Ramos . Garcia slashed a triple into right-center field and scored two. The RiverDogs left the inning up 3-1. Charleston stretched its lead further in the top of the ninth with another three-run outburst. First, Oswaldo Cabrera ripped an RBI double that plated Jerry Seitz. Later in the frame, Chris Hess and Welfrin Mateo struck back-to-back run-scoring singles. Hansel Moreno gave Columbia that initial 1-0 lead with a first-inning lead-off homer, his seventh of the season. Columbia's home finale is scheduled for Thursday at 7:05 ET against Charleston. It's the final Thirsty Thursday of the season and Grateful Dead Night at the park. The first 750 fans to enter Spirit Communications Park will receive a special Fireflies Grateful Dead Night t-shirt. Tickets can be purchased at FirefliesTickets.com. The pitching matchup on Thursday features RHP Marcel Renteria (4-3, 4.33) for the Fireflies and RHP Alex Mauricio (1-1, 4.82) for the RiverDogs. You can watch the action on MiLB.TV or listen in on FOX Sports Radio 1400 AM, ColumbiaFireflies.com and the iHeartRadio app starting at 6:45 p.m.